When it comes to Rocker Stoppers for Boats, they're a great little invention to reduce the rocking motion associated with waves commonly found at anchor or the marina. You simply hang them over the side of your boat. They are simple to deploy, easy to store, and an inexpensive way to smooth out that rocking and swaying motion while out at the beach, anchor, fishing, or sleeping overnight. Let's look at the product description, technical specifications, and how you can buy it now. Rocker Stoppers help dampen the rocking motion of boats at anchor. Simply tie Rocker Stoppers approximately 44 cm (18") apart, making a string of them, with a 5-10 pound weight attached at the bottom of the string. Hang one string off each side of the boat. Just four units per side are what it takes on most boats to 36'. Be sure you hang them where they will always be underwater. Many people use mushroom anchors with their Rocker Stoppers because this type of weight nests well inside the last Rocker Stopper in your string. Use 10 mm (3/8") braided nylon or 3-stranded nylon line. Use without a weight (or with reduced weight) for drift fishing. Rocker Stoppers will slow down drift substantially. They are also great to use at the end of a dock to stabilize the tip from rocking. 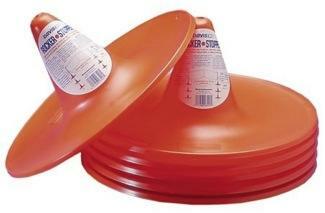 Rocker Stoppers nest together and each one is 33 cm (14") in diameter. It's lightweight and molded of high impact, virtually indestructible styrene. Can be deployed or retrieved in seconds. Unaffected by salt water and cannot affect the sides of your boat. Units are made to "nest" within each other, so storage is a breeze. 43 to 50 feet (13-15 m) - 8. 51 feet and up (15 m +) - 12. These are "per-side" of your boat.